An easy skillet cookie made with basic cookie ingredients cooked in a cast iron skillet! 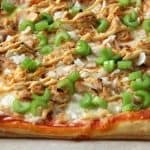 Preheat oven to 325degrees. Spray 6 inch skillet with non stick spray. Set aside. Stir in malted eggs and chocolate chips. Place in skillet and spread out evenly. Bake for 35-40 minutes or until toothpick inserted in the middle comes out clean. Press in 8 mini malted eggs into the top of the cookie. Welcome to this year’s #EasterSweetWeek event hosted by Angie from Big Bear’s Wife. We’re so glad that you’ve joined us for this week long event of Springtime and Easter dessert recipes! This year we have are 28 fantastic bloggers participating in this year’s Easter dessert event! 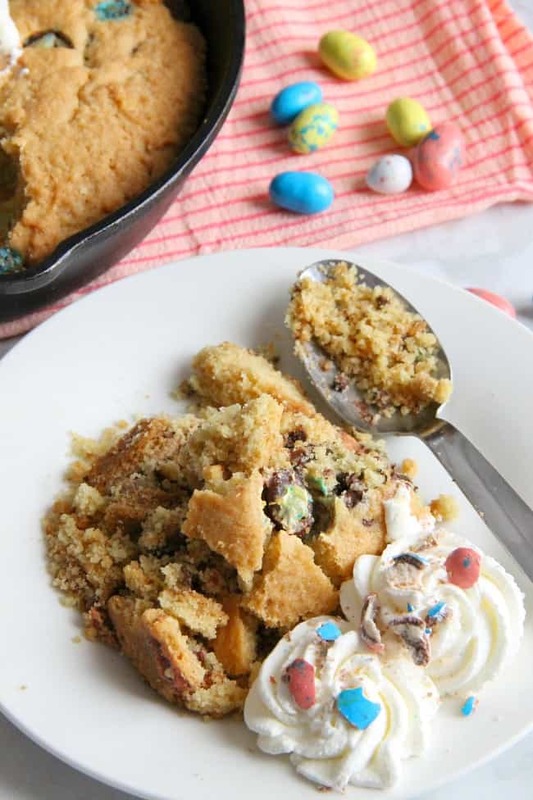 Throughout the week we’ll be share tons of great Springtime and Easter themed dessert recipes with you. 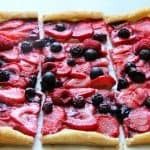 With over 75 sweet dessert recipes being shared this week we just know that you’re going to want to save some of these recipes to make again and again! 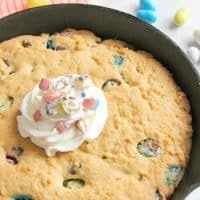 I’m always down for a seasonal skillet cookie! 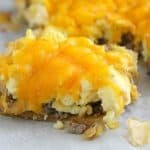 I love making skillet cookies! They’re always a favorite and I love this version! 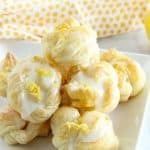 Perfect for dessert after Easter dinner!! I am not sure of any desserts that we have that are Easter specific, so I will go with carrot cake!! My favorite Easter treat is deviled eggs! 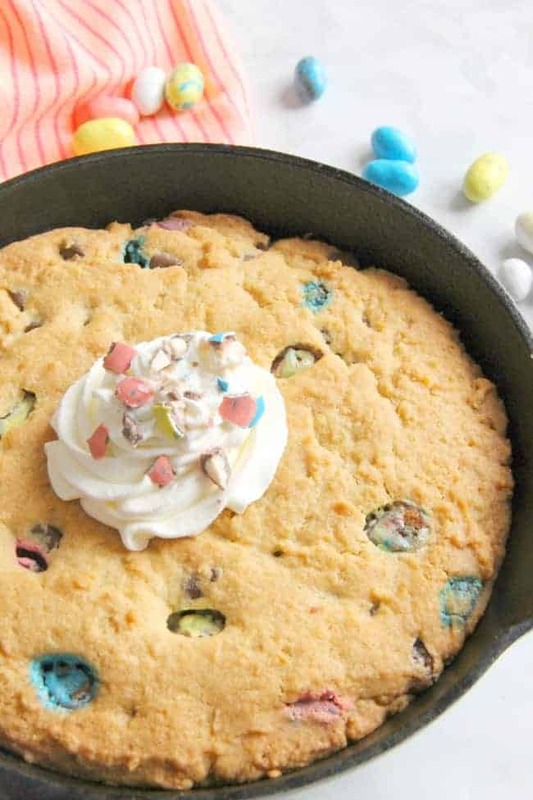 I have never tried to make cookie with skillet before, but this seems to be an amazing idea. Thanks for sharing. 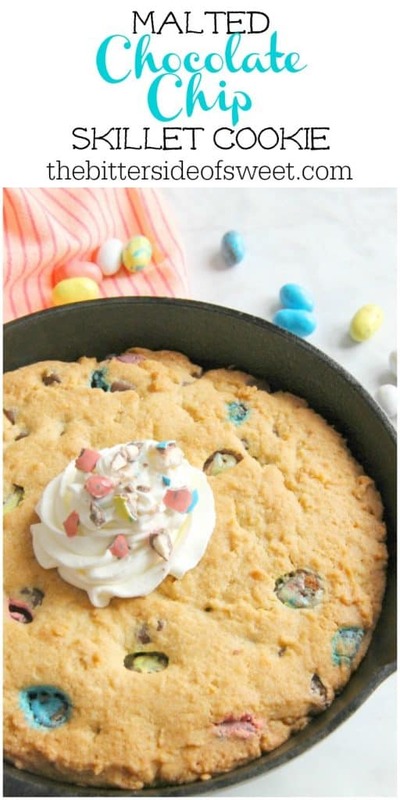 The skillet cookie looks amazing, especially with the malted eggs – that will put it over the top! 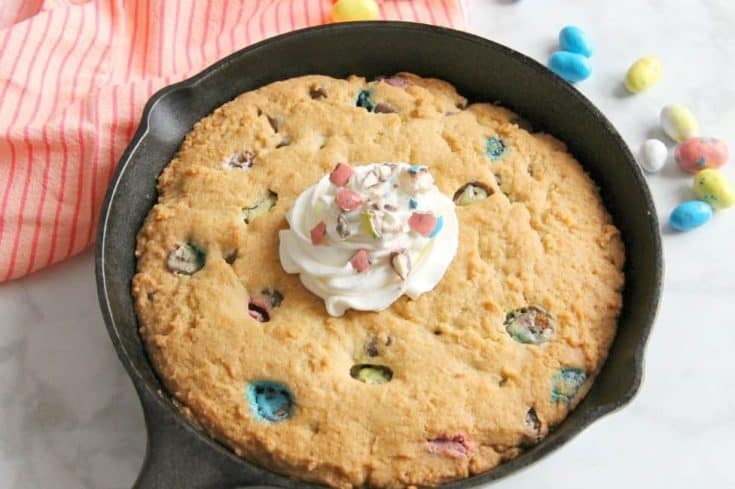 I’ll add it to my Easter dessert collection & will be trying it soon. My #1 favorite dessert for Easter, though, is banana pudding – the old-fashioned, make-your-own-custard-from-scratch kind. It disappears quickly! I’ve never made a skillet cookie, but did try a chocolate mug cake which was yummy. My favorite Easter desert is actually all the left over chocolate Easter Eggs. I LOVE mug cakes! In fact I’ll have a carrot cake mug cake tomorrow on the blog!